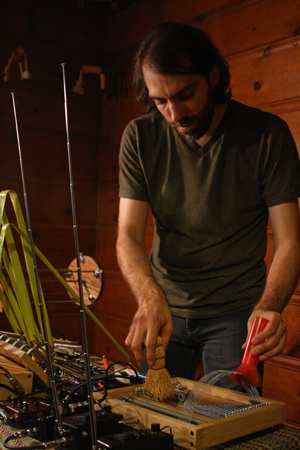 Bryan Day is a improviser, instrument inventor, illustrator and installation artist based in Richmond, CA. His work involves combining elements of the natural and man-made world using field recordings, custom audio generation software and homemade instruments. Day’s work explores the parallels between the patterns and systems in nature to those in contemporary society. Day has toured throughout the US, Europe, Japan, Korea, Argentina and Mexico, performing both solo as Sistrum and Eloine and in the Shelf Life and Seeded Plain ensembles. Festival appearances include Soundwave Festival (San Francisco, 2014), Thingamajigs Festival (San Francisco, 2013), New Media Sound and Art Summit (Austin, 2013), Milwaukee Noise Festival (Milwaukee, 2012), Denver Noise Festival (Denver, 2011), Heliotrope Festival (Minneapolis, 2010), Megapolis Festival (Baltimore, 2010), Denver Noise Festival (Denver, 2010), Transistor Festival (Denver, 2009), Quiet Music Festival (Cork, Ireland, 2008), Sonic Circuits Festival (Washington, D.C., 2007), Soundfield Festival (Chicago, 2005), and SubZero Festival (Minneapolis, 2001). Day has over 40 solo and ensemble releases on labels such as Creative Sources, Bug Incision, Friends and Relatives, Gameboy, Freedom From, Digitalis, Featherspines, Neus-318, Journal of Experimental Fiction, Unread, and Seagull. In addition to sound art production, Day is studying Butoh and physical theater. Since 1997 he has been running the new music label Public Eyesore and its sister label Eh?. Through Public Eyesore and Eh?, Day has produced and released over 200 albums of improvised and experimental music by artists from all over the globe and organized numerous tours for American artists in Japan. Day curated regular events at the Clawfoot House (Lincoln, 2009-2010), Tiptop Haus (Omaha, 2005-2007), The Magic Theatre (Omaha, 2006) and Sitting Still, Going Places first Friday series at Chatterbox (Lincoln, 2006-2007). Day is currently music curator at the Meridian Gallery in San Francisco.